It seems like every time I swing by Saugerties to run an errand there is a new business that has opened. 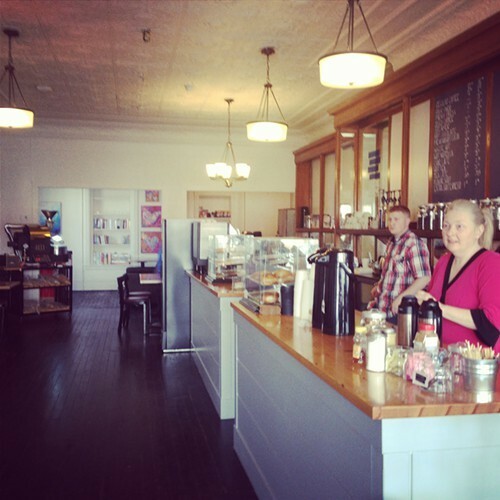 Yesterday I checked out Bluestone Roasting Company at 138 Partition Street. 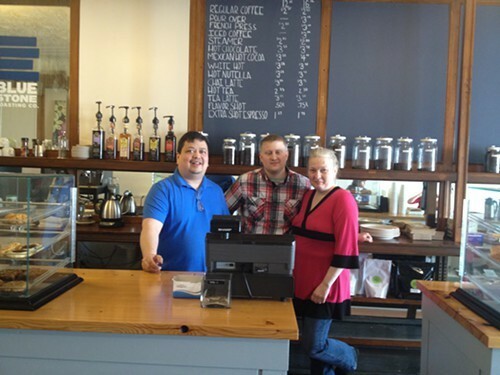 It has only been open for a week, and the owners, Mike, Joshua and Robbin were very happy to be welcoming in customers. I love good coffee so I’m excited to find a new place to have a quality cup of coffee in Saugerties. My husband and I both had the Rwanda roast, and it was delicious. My husband kept on saying how he enjoyed it even better than Starbucks coffee. (A high compliment from him as we go to Starbucks more often than I’d like to admit). They just finished writing their second chalkboard menu that includes such interesting specialty coffee drinks such as hot nutella with a shot of espresso, caffee machhiato, and salted caramel cappucino. Tea lovers will enjoy the shagadelic English breakfast tea served in one of those French press gadgets. Bluestone Roasting Company is planning to offer sandwiches and wraps. If you are in Saugerties, make sure you stop in for a cup of coffee. I can definitely see the Bluestone Roasting Company turning into a popular coffee and lunch destination in Saugerties.